Jack White included a Dunlop JD-4S Rotovibe Expression Pedal into his Raconteurs pedalboard so as to expand his sound. 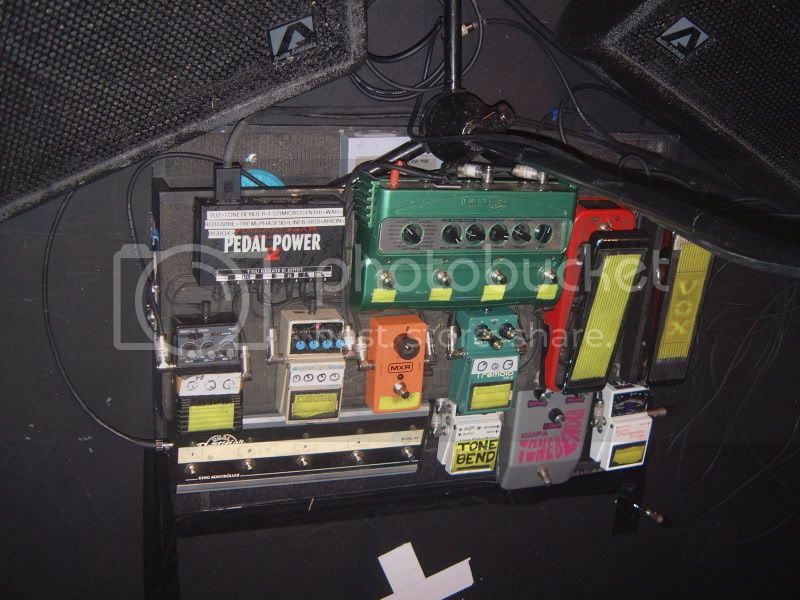 In this photo, you can see the Dunlop Rotovibe in Omar's pedalboard in 2009. Seen at 4:07 into this rig rundown video. Jerry Cantrell uses it in the Alice in Chains track God Am for "a sweep effect when he's doing an octave run"
As seen at (04:55) of this Guitarist Magazine Video "On The Road With Zakk Wylde," the Black Label Society guitarist uses a Dunlop Rotovibe® JD4S onstage. According to Wylde, he uses it "for that Robin Trower, Jimi Hendrix stuff." (4:55). On the official sheet music for "Come As You Are" it shows that he uses it for the Chorus. At 4:02 James talks about the Rotovibe Pedal. "It's my favorite swirly type of effect," he said. Here you can see the Dean's pedalboard with Dead Weather. Here you can find a Dunlop Rotovibe. In this picture, Andreas can be seen using a Dunlop Rotovibe. This pedal was only listed on Mesa's website. However, [the Guitar Player article](http://web.stargate.net/soundgarden/articles/gplayer_7-96.shtml) from 1996 states that he used this pedal way before 2011, on the song "Applebite". "GP: There are so many interesting tones on the new record. What's the subtle, pretty pitch-modulation effect on "Applebite"? KT: That's a Jim Dunlop Rotovibe in the Rotovibe setting, as opposed to the chorus setting. I'm playing my '59 Tele on that one, and it's pretty clean. We did two tracks of it, so the Rotovibe sweeps are going slightly off-kilter for an interesting phase difference. I really like the Rotovibe, although I don't go around playing with toys too much. I just figure the sounds are all in your fingers, your attack, the guitar and the amp. 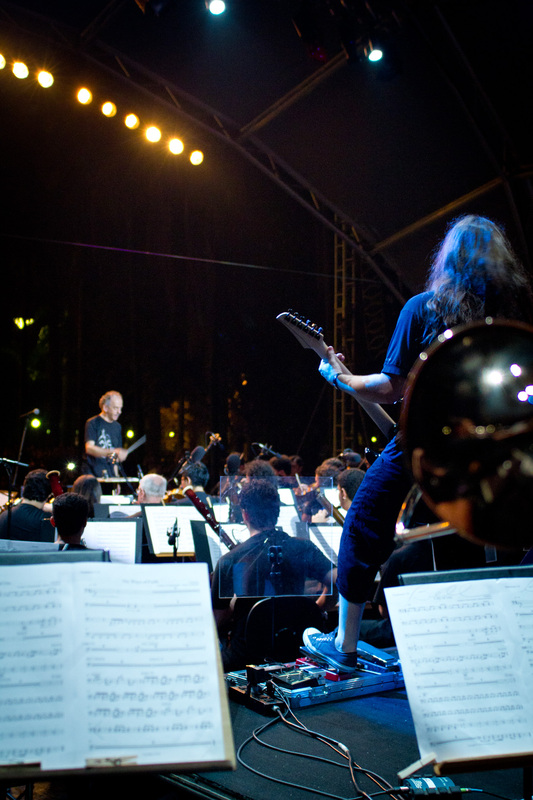 I'm much more interested in playing the guitar than doctoring my sound to get a certain effect." Another pedal used by Damon is a Dunlop JD-4S Rotovibe Expression Pedal. [Source](http://www.jimdunlop.com/artist/damon-johnson). "You said you don’t really hear effects, but you did use some stompboxes on the album—right? I don’t need any overdrive pedals because the amps have plenty of overdrive. But I used a CryBaby wah, a Dunlop JD-45 Rotovibe, a Dunlop TS1 Tremolo, a Boss OC-2 Octave, and a Mesa/Boogie Revolver rotating-speaker cabinet." Eric Gales uses a Rotovibe on this Dunlop Sessions gig, and it can be seen at 0:25. On the Eagles of Death Metal's 2015 tour, Catching used a Rotovibe as part of his pedalboard. 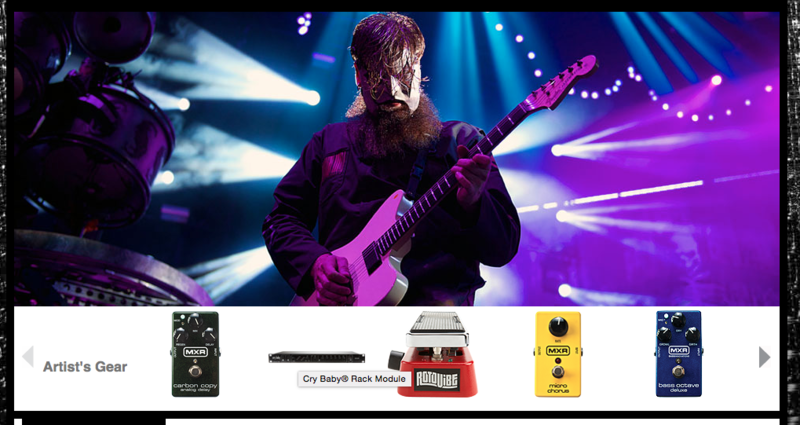 According to [Dunlop's website](http://www.jimdunlop.com/artist/jim-root), Jim Root uses a JD-4S Rotovibe Expression pedal. 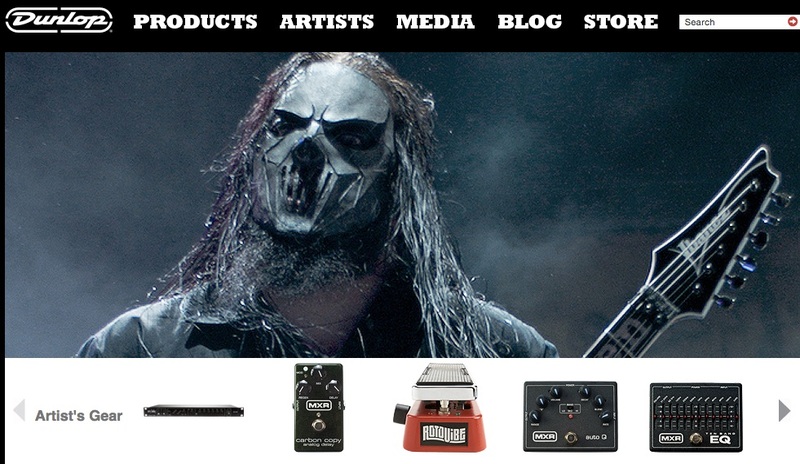 One of Mick's pedals is a Dunlop JD-4S Rotovibe Expression Pedal according to his [official artist page](http://www.jimdunlop.com/artist/mick-thomson) on Dunlop. Can be seen at the 26:21 mark along with the rest of his pedalboard. During Judas Priest's Epitaph tour, Faulkner's guitar tech, Adrian, gave a rig rundown. The Rotovibe is seen at 8:10, on Faulkner's onstage pedalboard. Can clearly be seen under his foot, to the right of his MP-1 controller. Gish era. On the photo of Shields' rig from 1991 we can see a Dunlop Rotovibe. Other effects he has been known to usePrince's Pedalboard include the Dunlop Rotovibe, Roland GP-16, and a Zoom 9030. This pedal is listed on the second page of this in depth issue of Musician Magazine from January of 1998. According to [this interview (transcribed from the February 1998 issue of *Guitar Player* magazine)](http://www.oocities.org/sunsetstrip/backstage/1076/article2f.html), Kevin utilized a Rotovibe (on the Uni-Vibe setting) during the recording of Third Eye Blind's self-titled debut album. 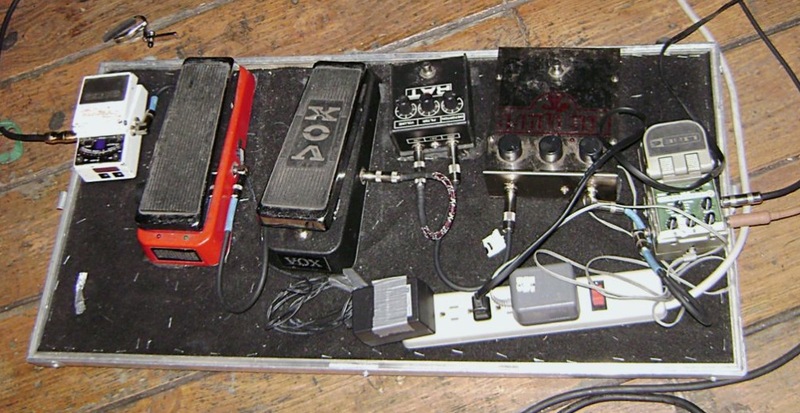 Grant has a Rotovibe on his 2009 pedalboard. In this pedal photo posted by Cheney on his Instagram account, one of the pedals that can be seen is the Dunlop Rotovibe pedal. "First up was a '56 Gibson LP Goldtop with P90 pickups that are super sweet. We plugged in a type of rotovibe pedal that was at the studio and we got a sweet swirly tone, plugged into a Fender Blackface Deluxe that was at George's studio." Rob Chapman dedicate a whole video to this pedal. To get that Floyd tone... you can hear this pedal in action in the end of the song "O.M.T." The Rotovibe is a chorus/vibrato effect that can simulate rotating speaker sounds popularized by Hendrix and many others This is a very expressive effect, thanks to its built-in real-time control. Choose either Chorus or Vibrato, adjust the intensity of the effect, and then control the effect's speed by rocking the pedal back and forth. A mainstay on Zakk Wylde's pedalboard. To me the Rotovibe is one of the most amazing pedals i own, its so easy to use, you just choose a setting from the vibrato, chorus etc. then you can just shelf it right where you need it, then your good to go. There's no other pedal i know of like it. A great guitar pedal that I use to get strange, rhythmic sounds from when in an extended jam. The sound is kind of a cross between a phase shifter and a Uni-Vibe. It's Hendrix like on the faster setting and adds color on the slower speeds. I like being able to adjust the rate on the fly too. One of the more influential pedals I have had. I rescued one of these from a heap of used gear at a guitar store awhile back. I wasn't sure what it did at the time but I'm glad I've got one. I think its a great alternative to the rotovibe pedal that Dunlop makes because you can control the speed of the vibe in real time with the sweep of the pedal. Looks like a wah, sounds like a synth. Used for jangly, clean sounds. I really like using this simply because it can take a beating.